I have been a long-time addict user of South of France products. Their soaps, lotions, and body washes are amazing. Fragrant, clean, soothing, and moisturizing. What's not to love? I recently received several bars of soap and a couple of liquid soaps for review. And I'm going to share with you! But first, let me tell you about South of France! "Why We Exist: We believe that individuals should have the right to live healthier lives if they so choose. We believe that this right can only be exercised if people have access to affordable, all natural, superior performing and healthier-for-you products, products that Good Health is committed to creating in order to realize the vision of a world in which one can make the best choices for themselves and their families." South of France Soaps are free of sodium lauryl/laureth sulfate, EDTA, paraben and phthalates and never tested on animals. (Cruelty-free is important to us all!) 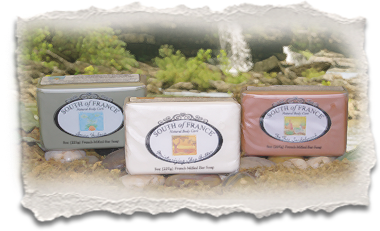 The luxurious South of France® soap is kettle cooked in small batches using a traditional Marseille recipe with all natural vegetable ingredients. Each fragrance is chosen specifically for its cleansing and calming qualities. One of our favourites is the Shea Butter. This is extremely soothing to rough, dry skin in the winter months. Light fragrance and rich, moisturizing lather makes it perfect for the entire family. This is Mike's go-to soap. His skin is so dry and sensitive. For him, a good shea butter soap is a MUST. I have to tell you -- these soaps last a long time! I purchased a bar of Lemon Verbena in March -- and used it up in late June. And the fragrance never faded. Perfection! Another favourite is the invigorating Green Tea! Snappy, clean fragrance, lots of lather, and a tingly finish. Great soap to get you motivated. I love it. South of France offers many delightful fragrances: Acai Pomegranate, Amber Rose, Cashmere Honeysuckle, Lemon Verbena, Menthe, and more! You'll find many of these same fragrances in their lotions, body washes, and hand soaps. Oh! The liquid hand-soaps! These are fantastic! I keep one in my bathroom and one at the kitchen sink! The Shea Butter is a blessing in the kitchen. I don't have a dishwasher -- well, I have me -- so my hands get so dried out and scaly. The shea butter hand soap after washing dishes rapidly soothes my hands. I have the Green Tea liquid soap in my bath. It smells so good and cleans so well. The marvelous folks at South of France have generously provided bar soap and hand soap to me to share with you! Open to USA only, please. One entry per email per household, please. ALL ENTRIES ARE VERIFIED! Ends 10/29/12. DISCLOSURE: I received bar soaps and hand-soaps in order to facilitate this review. I received no monetary compensation. The opinions expressed herein are my own and based on my own use of and experience with the items. I think the Cucumber Aloe soap sounds pretty good. I would love to try the Almond & Amber Rose. I would like to try the Gardenia and the Honey bar soaps. Thanks for the opportunity! Hard to choose just one! The Almond and Amber Rose is my favorite though. Thanks! Lemon Verbena and Mango sound great! I'd like to try their amber rose and tea tree sandalwood soaps. The Orange Blossom Honey sounds wonderful! I'd like to try the almond soap and gardenia soap. I'd like to try the gardenia. I want the Green Tea and the Honey 8oz Bar soaps, sound wonderful! Great giveaway! The Almond and Honey both sound great! I would like to try the Almond and Amber Rose. I'd love to try the Honey and the Magnolia Pear! I'd love to try the magnolia pear bar soap :). The amber rose sounds lovely. I'd like to try gardenia and lilac. I'd love to try their Moisturizing Shea Butter Soap and the Magnolia Pear Soap. I'd like to try Lavender and Lemon Verbena. I would like the green tea and the mango. I'd like to try the cucumber aloe soap. I'd like to try the Gardenia & the Amber Rose soaps. I would love to try the Lilac and Lavender bar soaps. I would like to try the Shea Butter body wash. I would love to try their she butter and tea tree sandalwood bar soaps. I would love to try the Honey and the Shea Butter soaps. I 'd like to try their body washes in Gardenia and/or Cucumber Aloe. Amber Rose, Lavendar and Lilac all sound like they'd create an floral aura that would follow me everywhere when using the bar soap. I would love to try the Mango and Lilac Soap Bars! I would like to try Almond! I'd like to try the Acai Pomegranate body wash. I would love to try the Lemon Verbena. I'd love to try the Gardenia! I'd like to try the Lavender bar soaps! I like florals, so the Lavender, Gardenia, and Cashmere Honeysuckle would be ones I would like to try. I would like to try the Menthe, Tea Tree Sandalwood, and Green Tea soaps. Thanks for the giveaway... Green Tea Body Wash. I would like to try the Almond soaps. You can use my coupon code NAK992 to get $5 off your first purchase + free shipping for orders over $40 + free samples.﻿ They ship worldwide.